Many hear the call, but only a few are chosen. 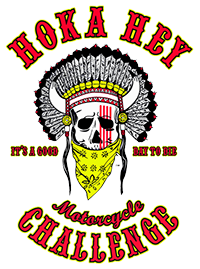 Community is an integral part of the Hoka Hey Motorcycle Challenge™. Linked by a common vision, new communities are built and others are extended. Riders form strong bonds, families and supporters unite, vendors interact with motorcycle enthusiasts and fans come together to create their own communities. The Hoka Hey Motorcycle Challenge™ also supports community spirit, bringing visibility to worthy causes and often unheard of communities and encouraging sponsorship of non-profit groups, veterans and riders. If you’re looking to get connected … as an event sponsor, a rider or nonprofit team sponsor, a corporate sponsor or a rider in need of a sponsor, Hoka Hey can help build bonds that will last a lifetime. Potential sponsors and any one hoping to ride can get more information by reviewing our Rider Package or by contacting us at 605-890-0386 or email us at info@hokaheychallenge.com. Don't think you can afford to take part in Hoka Hey Motorcycle Challenge™ in 2020? Veterans should apply for our Sponsor a Veteran Program. Or it's as easy as contacting your favorite restaurant or bar!! Go ahead and ask at your place of employment. Or ask for support from the manufacturers of products you use every day! Seek out the local motorcycle dealership or custom bike shop and ask them to sponsor you on your ride! - Take our Rider's Package with you and let potential sponsors know that you are willing to work to make it worth their while! - Sell advertising on your windshields and saddlebags! - Build a website that promotes you and your sponsors!! - Offer to co-host a fund raising event on their property!!! If you can bring customers into their store and bring support and notice to you as a rider in the Hoka Hey Motorcycle Challenge - the sky will be the limit and the world is your oyster!! In honor of the veterans who lost brothers and sisters in the heat of battle; for the families who sacrificed a son or a daughter; and the children sometimes orphaned by loss of a parent, let's stop paying lip service to how much we appreciate our freedom. Let's join together and show that appreciation to the very people who made it a reality. Sponsoring a rider, who also happens to be a veteran, in Hoka Hey Motorcycle Challenge™ tells that veteran, and all American people, that we have not forgotten them. Rather, the message becomes that we value the lives changed forever and the memory of the fallen that has been indelibly etched into the American consciousness. These are not just riders, they are Freedom Riders. As you know, many of our veterans live on a fixed income. Consequently, they would not be able to participate in this ride without your support. Please give a little bit back by putting a veteran rider on the open road across the very country they have defended. We have talked to at least 100 veteran riders who would literally do anything to participate in this Challenge. We want to give your organization the chance to demonstrate your appreciation for the freedom they have defended through the sacrifices they have made; to give you the chance to provide that veteran with the opportunity to ride by helping to cover some of the cost of participation. We know you are passionate about motorcycles and the freedom that one feels on the open road. Together, we can add a page to history, while giving a very personal "thank you" and showing our appreciation to someone who survived the hell of war. Your logo will be prominently displayed on the veteran's bike and you will receive credit for your role in making the Challenge a success. Most importantly, you will know that you have done your part to say “Thank you” to a veteran by making it possible for them to ride. There's no better time than right now to generously lift many veterans’ spirits. So please, take this opportunity to show our veterans that we have not forgotten them and that we appreciate and value the freedom they have defended through the sacrifices they have made. Please fill out and submit the Agreement to Accept Sponsorship along with your application! You may Apply Online or you may scan the signed application/waiver/terms and email them to info@hokaheychallenge.com. Register here to be included in our email updates. Potential sponsors and veterans hoping to ride can get more information by reviewing our Rider's Package or by contacting us at 605-890-0386. By contacting the office today, we can get your name on the list and will do everything in our power to bring sponsors and riders together as quickly as possible. Don't be afraid to ask. It's only impossible if you quit. Copyright 2019 Medicine Show LLC. All Rights Reserved.